शिक्षा बचाओ -- Shiksha Bachao: Rana Pratap.. Who? While all that goes on in books, thre is also a parallel conspiracy which goes under the garb of rewriting the most popular patriotic songs of the about-1947 patriotic era. May be some of ypu have noticed, but vande matram has been rewritten not once but many times, each time losing the original fervor altogether in the name of secularism. Similarily "rang de basanti" too has two new forms, none of them includes the paras from the original which glorified, Shivaji and Rani Jhansi. It is a full blown conspiracy under the name of modern music and our youth are embracing it with open arms, as they do not know any better. to portray the rajputs as 'hostile' and as miscreants is shameful.these are our ancestors who fought for the pride of the nation and its people.these are the people who gave up their lives to save our motherland from the clutches of the barbaric islamic looters and murderers...and this is how you repay them. SHAME ON ALL YOU POLITICIANS AND HISTORIANS.you have lost your soul to the left ideology,you burdens of this earth. will these people also refer to our jawans who are protecting our boundaries in such fashion? You are absolutely right here in predicting the future, Shivali. Our Jawans do run the risk of being dubbed "hostile", as they protect our boundaries against our "best friend and neighbor". The past many wars are a witness to the fact that our politicians have always undermined the sacrifices of our soldiers, and bowed to petty politics and made truces and stupid decisions for which our armed forces are paying the price till today. Good patriotic, selfless leaders, are in such short supply that I wonder if they even exist, or in this Kalyug, power corrupts one and all alike? The material is just memorized and reproduced in the exam, what is written in book, does not matter. The example of this, current youth, who read all these things in their classes and but not remembered. What we remember -what society tells us. 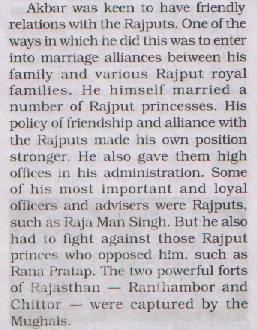 Every youth know that who was Rana Pratap and who was Akabar. No one is misguided by this books and cannot, because after reproducing the things in the exam we have to make space for new things for new class, so we have to forget all these things. History should be concise and limited to fill confidence in the student towards its culture and country, and should not be written for memorizing and reproducing in the exam. But present situation don't fill any purpose. So don't worry, it will not harm country. What country is more harming is our education system which is based on student's memorizing skills and don't generate any practical and problem solving skills in them. it doesn't matter how many times you read the books 'How to swim'. It doesn't matter how good score you can get in exam. Our education system believe that by studying the book 'how to swim' and getting good score in the exam, you become a certified swimmer. This is real problem of our country. Until we stop knowledge building process and start practical exploration and creative thinking skills, nothings matters. Wrong history will affect only when we get time to our student to think upon it, to make their own view upon it and write their view on exam, not reproduction of bookish material. BUt in really, we are very far away from development of innovative and creative skills in students, so any correct history will not fill confidence in them and any wrong history will not take any harm to them. Because they know the use of book is limited to getting good scores only and not related to real life, even not a bit.